Yet she is aware of the difficult task of educating people in the states of Bihar, Jharkhand, Uttar Pradesh and West Bengal about not sacrificing animals at future festivals. Gadhimai Temple Trust Chairman Mr Ram Chandra Shah’s statement was compassionate and forward thinking. The concern is how to bring slaughter festival devotees on the journey to another way of receiving favour from the goddess. Shah thanked AANN and HSI/India for their dedication in making this transformation possible and expressed the trust’s commitment to change. Shah believes that mass education can bring enlightenment and prosperity to the Gadhimai region and peace to the Gadhimai Temple. Manoj Gautam, founding member of AWNN and campaigner against the Gadhimai slaughter festival, said the key to this result was the move to work directly with the temple committee, supported by HSI/India. The Hindu Gadhimai festival is held at Bariyarpur in the Bara district of southern Nepal every five years. The festival has attracted growing worldwide attention and outrage for the barbaric slaughter of hundreds of thousands of animals in the name of religion. 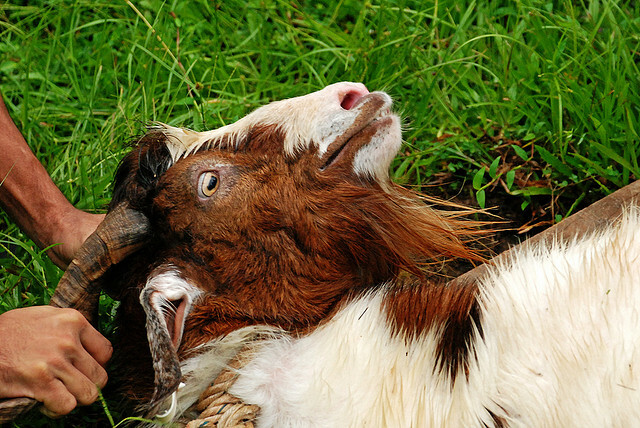 The centuries-old ritual is considered to be the largest animal sacrifice in the world. 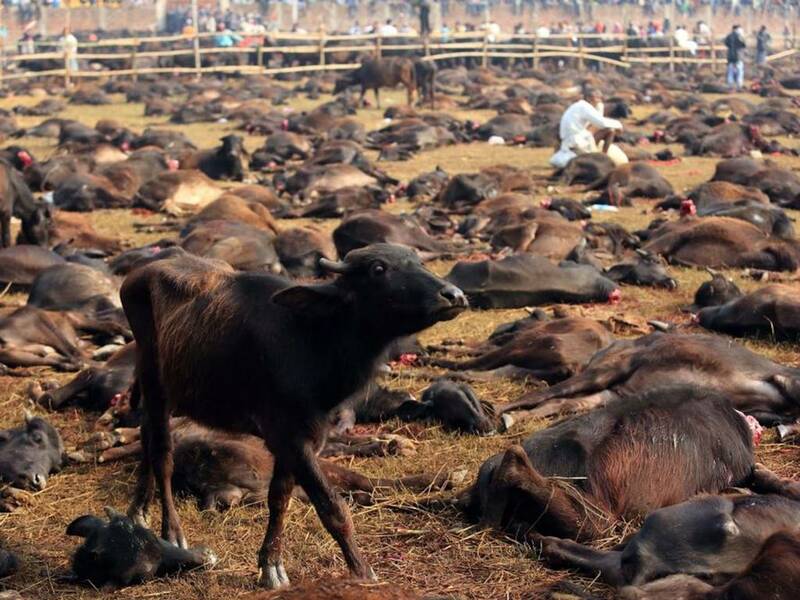 Hindus believe that animal sacrifices to Gadhimai, goddess of power, will bring them good fortune, health and happiness. Hindus from India and Nepal attend the festival, with most devotees coming from India. During the 2009 Gadhimai festival, it’s estimated that more than 500,000 buffalo, goats, chickens and other animals were decapitated. In 2014, this number had reduced to 200,000 with 5,000 buffalo sacrificed compared to 7,500 in 2009, a member of the post-sacrifice management committee told Ekantipur. The reduction is the direct result of campaigning by animal rights groups that was supported by worldwide protests. An interim order passed by the Indian Supreme Court asked Indian states on the border with Nepal to stop animals crossing during the festival. Gauri Maulekhi, the HSI/India campaigner who filed the petition to the Supreme Court, said an estimated 10,000 buffalo were confiscated in November 2014. The Supreme Court’s action followed a decision by a court in Northern India to ban animal sacrifices for religious reasons in places of worship and adjoining lands in the state of Himachal Pradesh. The Hindu religion doesn’t condone animal sacrifice, but goats and sheep are slaughtered in Hindu temples in India’s southern and eastern regions. 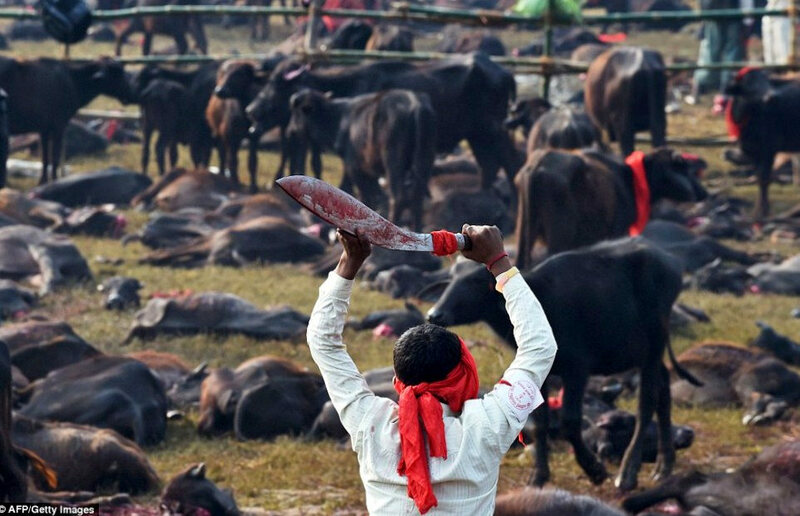 When you look at the disturbing images of the Gadhimai festival, it’s hard to imagine the fear and superstition of families involved that drives their participation in such brutal slaughter. Why does a mother take her children to see animals decapitated in this arena devoid of empathy? Nepalise news agency Ekantipur reports a story from the 2014 festival that helps to explain. Five minutes before buffaloes began to be slaughtered at the Gadhimai fair, five-year-old Bir Bahadur’s mother Ajay Kumari rushed with him into the slaughter field and asked him to kneel, fold his hands and pray in front of one of the larger buffaloes. Swami Aginvesh, social activist and president of the World Council of Arya Samaj questions what we’re teaching children and the impact it has when children as young as five are pulling calves into the field. Many Hindus believe animal sacrifice contradicts the Hindu principle of ahimsa, or non-harm, and experts suggest a link between animal abuse and human violence. It isn’t just the temple killing fields where animals suffer. Animal Equality witnessed animals treated as commodities on the journey. Aware of the ban on animal transportation across the border, devotees tried to hide animals. Pigeons were hidden under clothing, or crammed into baskets or plastic bags. Goats were kept between men’s legs on crowded buses, or closed in tiny, dark luggage compartments without ventilation, food, or water. Many buffalo calves that were taken across unmanned points on the 625 km border were forced to walk great distances with little or no water. With exposed ribs and already weak, they arrived exhausted. Folklore belief is that the goddess Gadhimai is angered by cruelty to animals before the sacrifice, but Animal Equality saw no evidence of concern for animal welfare or the goddess’s anger. Animals have water poured on them, and when they shake it off it is the sign that the goddess has taken ownership and the animal is ready for sacrifice. Buffaloes and goats witnessed animals slaughtered around them. There was no escape from the fenced killing fields and soon the ground was awash with blood, corpses and body parts. “I get this strange kind of energy when I am on the slaughter field. I don’t feel remorse—not at all. I just feel lucky that I am pleasing the Goddess, It’s a part of our culture,” said 38-year-old Yadav Kumar. Men were paid by the priests for each animal decapitated in the main arena. A contract awarded to the highest bidder usually pays dividends with the export of meat, leather and bones. Spectators paid a viewing fee and anyone could sacrifice an animal within 3 km of the temple for a fee. In 2014, temple profits were down after the contracted agent pulled out because of the reduction in slaughtered animals and potential profit. “The animal sacrifice at Gadhimai temple is nothing but trade carried out in the name of ‘tradition’,” says Animal Equity. A witness of the 2009 festival, director of HSI/India, is haunted by the event’s graphic images of terrified animals yanked by a rope around their neck, their hind legs restrained as they kick. A ‘butcher’, a factory or farm worker hoping for prosperity from the goddess, hacks off the head. Other animals are so exhausted, they don’t struggle. This isn’t a scene from a horror movie. It’s a family festival. Animal Equality reported health hazards at the temple, where surrounding fields were polluted with human excrement and rubbish. Bodies were removed from the killing fields, but heads and intestines were left to rot. There is uncertainty over the origins of the mythology too. The founder of the Gadhimai Temple, Bhagwan Chowdhary, had a dream that the goddess Gadhimai wanted blood in return for freeing him from prison, and granting him protection and prosperity. The goddess asked for a human sacrifice, but the tradition now involves an animal sacrifice. Coconut sacrifices to the goddess are frequently made in other Nepalese temples. On The Hindu news website, public response to the Gadhimai Temple Trust statement on a blood-free festival has been mostly positive. “As a human being, as a Hindu. I feel part of me is saved,” said a relieved reader, echoing the thoughts of many other peace-loving readers. Pro-sacrifice readers question HSI/India’s notion of a victory for compassion that will save the lives of many animals, arguing that the animals would die and be eaten anyway. They hold slaughterhouses up for scrutiny, asking what the difference is between an animal killed at the festival and one killed at a slaughterhouse. A regulated slaughterhouse is required to minimise pain and suffering. On the temple killing fields, animals were terrorised amidst the slaughter, and families watched these butchers. Although the argument about poor animal welfare on intensive farms is valid, it doesn’t justify animal abuse at the festival. It highlights further that we need to do more to protect animals. Some animal sacrifice defenders see the campaign against the festival bloodshed as the persecution of Hindus from within and beyond India and Nepal. But this landmark decision isn’t about specific religions. It’s about the compassionate ending of the inhumane mass slaughter and exploitation of animals. It lights the way forward in morality and spirituality from a humanity perspective, regardless of religion. Other countries must now look at their own treatment of animals, including intensive farms and slaughterhouses, and rituals involving animal slaughter. Like humans, animals experience pain and suffering, and deserve our care and respect, and our children deserve to be shown how to give this care and respect. A “momentous celebration of life” is a wonderful idea. Let the enlightenment begin.